In 1942, a military blimp left for a routine submarine spotting mission. A few hours later, it crashed back on land with no one onboard. It was dubbed "The Ghost Blimp" and it looks like Reddit just laid the mystery to rest. US Navy Blimp L-8 took off from Treasure Island in the San Francisco Bay early in the morning of August 16, 1942 on a routine mission to look for Japanese submarines in the Pacific. The two-man crew radio'd in only once. It was an hour and a half into the trip, reporting an oil slick on the water past the Farallon Islands. Three hours later the blimp came ashore just south of San Francisco, eight miles off course. The blimp hit the beach, bounced up and struck a cliff. This knocked off a depth charge from the blimp. Hundreds of people witnessed the first landing. The collapsing blimp then crashed into the nearby Daly City. To be specific, it crashed into a woman's house, reports a local historian via Unsolved Mysteries. No one was onboard when the crash was inspected. The door was open and its safety bar was gone. Two of the three lifejackets were gone, which would follow regulations that crew members wear lifejackets. One of the crew's caps was still on the controls. A locked briefcase containing secret codes was still locked and in place. 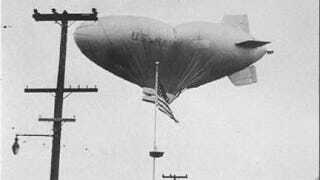 It remained a mystery as to how the men disappeared, and the story of the Ghost Blimp has been retold many times in its 70-year history. That is, until it got on the front page of Reddit today and user syndicated_writer gave this withering response. I'm going to go out on a limb here...this is pure speculation...but my guess is they fell out.